Oh super excited this morning! So way back when I did a Three oh Three AM misheard lyrics blog. 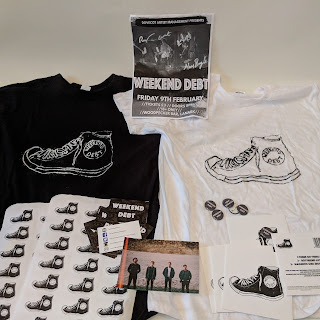 I got a reply on Facebook off Grant where he sent the actual lyrics and said to message him and he would send some merch. I messaged but I didn't give my address, I felt cheeky messaging just to get free merch, so I just discussed the bands tracks and gigs and left it at that. Anyways I decided I'd support the band and actually buy a T-Shirt (£5 limited edition), having ordered 1 black Weekend Debt T-Shirt, it took a few weeks and hadn't received anything, so I dropped Dougie @ Dovecot an email following up the order and he apologised on the delay and said he'd sort it and chuck some extras in. Well... Today the parcel came, and that parcel was far bigger than anyone would have expected. 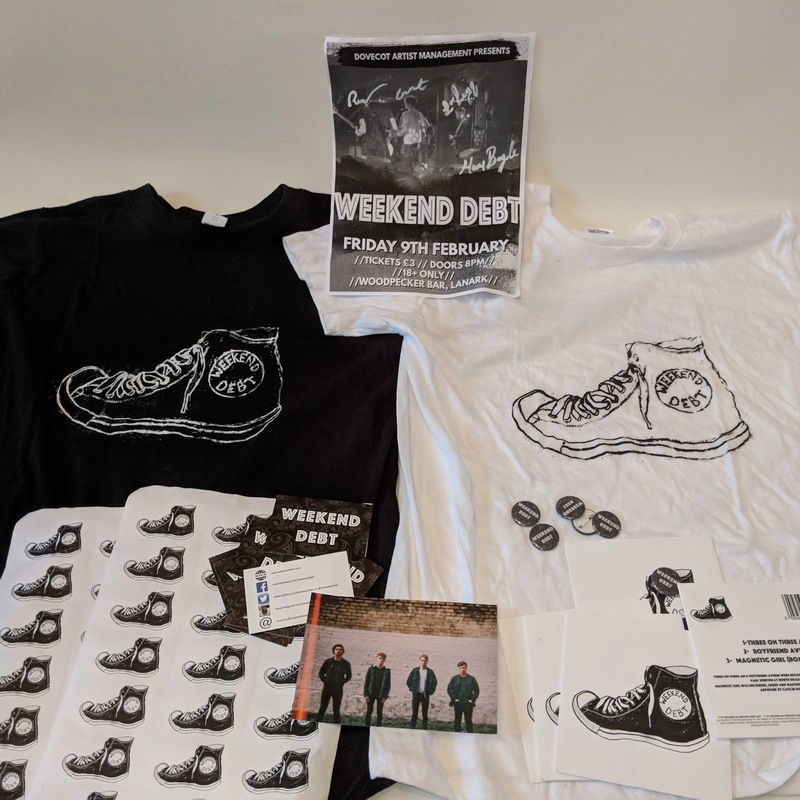 2 T-shirts, 5 copies of their EP, Stickers, Business cards, Buttons, a signed Poster and a Photo!! And now it's not just me blogging about my views, it's a team! We've started a brand and we're promoting it and our favourite artists. Who knows how far we'll take this, full blown music promotion? For now though A Life Of Music Rocks and we'll be sharing it with you! And with all the extra merch we're looking into some competitions ideas.... Watch this space.